Stephanie, Foley, Shane, and Bryan are all already on the stage. Stephanie wants to immediately get down to business. RAW has the first pick: Seth Rollins. SmackDown’s first pick: Dean Ambrose. Cena’s music then plays, and he heads to the ring. An okay match. There wasn’t really a whole lot to it. Gallows was methodical and dominated, then Enzo, Cass, Styles, and Anderson got into it with each other, then Cena hit a move. I think the most notable thing about this match was that they went to a commercial break, but they just shrank the screen and allowed up to watch the match in its entirety throughout the break. It was an interesting way to handle commercials if they absolutely must be taken during a match. Time for the next round of picks. Pretty good match. It seemed to go pretty quickly, but there were some good moves and moments. It was good (and important) to see Darren Young use the cross-face chicken wing. Good match. Woods’ fear of the Wyatts played a big part in the match. It was a little bit of a beating, but Woods did come back with some offense. It makes things interesting for the Battleground match, because Woods is potentially the weak link, but if he can overcome his fear and help New Day win then he can be a big hero. It’s a good setup. Kane is in the ring, ready for the next match. His opponent is Kevin Owens who yells at the leaders of RAW and SmackDown for not picking him yet. As he heads to the ring, Sami Zayn runs out and attacks. Owens tries to feed Zayn to Kane, but Kane ends up chokeslamming both Zayn and Owens at the same time. 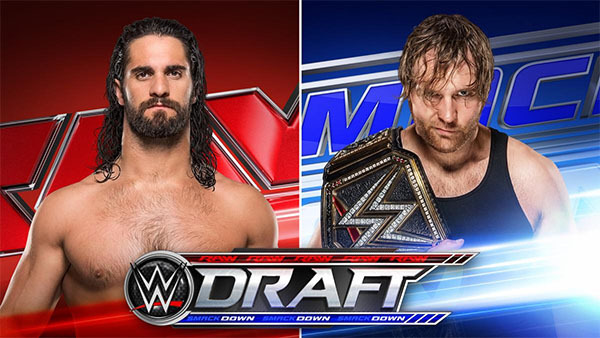 From the Draft Center on WWE Network, Dean Ambrose is happy to be going to SmackDown. With the WWE Title. Pretty good match. It was short, but all three of them worked well together. There was a sequence on the outside that looked particularly good and hard-hitting. Very good match. Both guys had some great counters, and the finish was a lot of fun. Back from the break, Becky Lynch is attacking Natalya as the referees try to pull them apart. ** And just as I was complimenting RAW, they start to slip. This round easily goes to SmackDown. From the Draft Center, Rollins reacts to being drafted first overall. Good match. I think their match on RAW might have been slightly better, but this was pretty much on the same level. I liked the show. The draft wasn’t super surprising, but it was fun. I liked that they’re trying some new things with SmackDown Live. For example: having a match play in the corner of the screen while on a commercial break, joining the action in the middle of a brawl (Becky and Natalya) after a commercial break, and the attempt at a second-screen experience on the Network. I think they still need to work on the second-screen thing though. You can’t just put a normal show on there and call it a compatible experience. I tried having SmackDown and the Draft Center up at the same time, but it was too distracting. I ended up muting the Network while SmackDown was on and just turned to the Draft Center during commercial breaks. I think a better second-screen experience might be something on WWE.com. Have trivia and tweets and stuff pop up in conjunction with the live show, then have interviews and commentary during the breaks. It was just impossible to concentrate on both at the same time. I liked the main event, but we saw it on RAW last night, and Jericho versus Cesaro was very good.